This is another time-released post while I’m out of town. I will leave comments open, but I probably won’t be able to address any questions for at least a few days. Today’s image is from the most proximal part of Bute Inlet, which is a deep-water fjord (some get up to 700 m deep) in British Columbia, Canada. 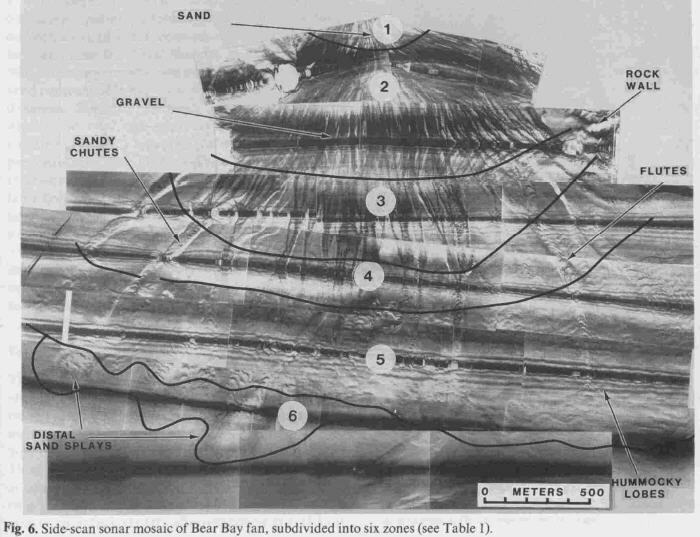 A classic paper from 1989 by Prior and Bornhold is often cited in current papers that discuss what happens to riverine sediment when it reaches the sea. In this case, Prior and Bornhold document a subaqueous fan delta that has been building out the last several thousand years. The image above is a side-scan sonar image of the fjord floor just offshore from the mouth of Bear Creek. If it looks a little old-school … well, it is … the data were acquired in 1986. 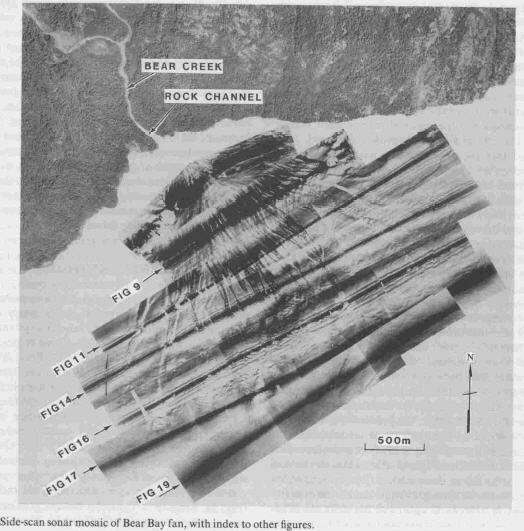 Side-scan sonar methods were very much the state-of-the-art at that time. The straight dark lines going diagonally from lower left to upper right are artifacts of the acquisition. Just try and ignore those and look “through” them (kind of like when you are looking at an outcrop, you try and look through all the surficial diagenetic crud to see the primary features). Note the exquisite distributary pattern coming out of the creek mouth. They supplemented bathymetric and seismic-reflection profiles with some dives in a manned submersible and some grab samples to document the type and distribution of sediment on the fan. This image below summarizes that. I’m not going to show them here, but then they present several photographs of the fan surface taken from the submersible at various points along the profile of the fan. Finally, I’ll skip right to the summary figure … this block diagram puts it all together. I recommend reading this paper if you are a sedimentary geologist because of the topic. But, I also recommend it if you want to read a well-written scientific paper. The data presentation is objective and systematic; the discussion is engaging and thought-provoking. Although the data might be ‘old school’, some of the ideas they discuss and some of the implications of their work are very relevant in the current literature. Sometimes I see papers now that present new and interesting data, but mix the data and interpretation too much. I’m still learning how to avoid this myself. 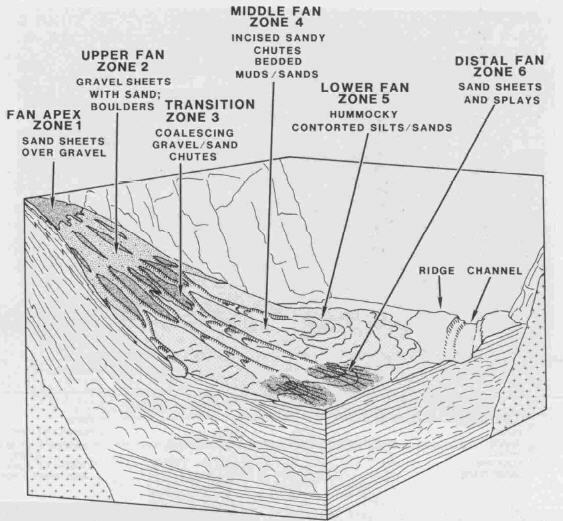 Prior, D.B., and Bornhold, B.D., 1989, Submarine sedimentation on a developing Holocene fan delta: Sedimentology, 36, 1053-1076. Mufti … sure, it’s possible, but it depends on many factors (e.g, depth of sedimentary sequence, distribution of petroleum source rocks, migration history, and so on). Delta sequences can be good stratigraphic traps for hydrocarbons, but all those other factors need to be there as well. Unfortunately I don’t know anything about the petroleum systems and sedimentary basins near Borneo … I’d hate to give out bad information. It may not have the info you are looking for, but it might cite other references that will help you.